Now that the weather has turned too cold & blustery to grow things in the garden, we’ve moved our efforts indoors. A couple weeks ago I bought a dozen paperwhite bulbs and had the kids help me plant them all in various sized bowls and two re-purposed clay yogurt containers. Maggie has taken it upon herself to be the official waterer and they all delight in reporting on our flowers’ growth. Last night one of our plants blossomed and you would not believe the excitement! This is such an easy way to bring a bit of green learning into the house and makes everything that much cheerier all around — even when it’s pouring rain outside as it is now. I’m curious, how do you bring green into your home in winter? 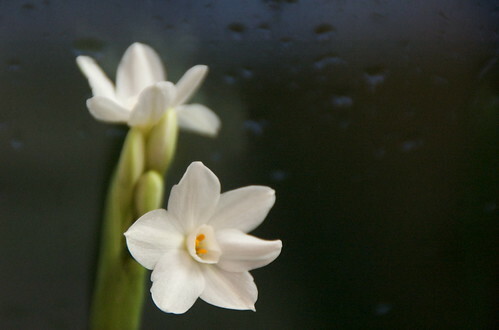 Oh, paper whites are one of our favorite as well! I love to have amaryllis (white and red) in our home the whole holiday season. Poinsettias have also been a traditional part of holiday decoration in my family from when I was a kid. I would also love to have hyacinths around, but I’m allergic. They’re so pretty in pink and white! Flowers really bring the feeling of the season. Happy holiday preparations to your whole family! We are in california, so we do have things growing outside, but inside I’ve got orchids and a wondlerful Christmas Cactus which is in bloom. I highly recommend it! Thank you for your wonderful, inspiring site. I love it.